1999. David Tollefson, perhaps best known as half of Viridian Sun, also received much praise for his 1997 solo debut on Hypnos entitled NEW EYES ON THE UNIVERSE. Like his debut, NEAR AND FAR is at times both musical and dramatic, while at other moments unabashedly experimentalist in its approach. Every sound on this CD was made with an electric guitar, though many will doubt this claim, as with Tollefson's previous work. Whether or not your consider yourself a fan of "guitar music," you'll find an astonishing sonic variety here, as well as an unquestionable breadth of artistic reach. "Top 10 Albums of 2000." "As I was listening to Near and Far in anticipation of writing this review, the first snowfall of the year descended upon Central Pennsylvania, and the sense of reverie evoked by that event went particularly well with the sounds on this album. David Tollefson's pieces seem to reflect on forces of nature, yet are one step removed from those forces, much like the phenomenon of watching a snowfall through a window. Abstract works in the vein of Tollefson and M Griffin's group Viridian Sun are interspersed on Near and Far with very delicate, ringing guitar themes. I prefer the former, but the shifts in musical approach have their own worth and do a great deal for the album. In the same way, parts of Near and Far lull the ears into a comfortable state, while other parts present a very direct challenge, with odd sounds working their way in at odd places. As the title would suggest, alternation and the conflict and confluence of opposites appear to be the major themes here." "Like his fellow Hypnos artist Jeff Pearce, David Tollefson relies exclusively on electric guitar and its electronic modifications to generate his sounds. But that's just about all that the two guitarists have in common. While Pearce seeks out a clear, bright, and harmonically tonal sound, Tollefson explores the more experimental and difficult realms of microtonal drones and a sound that is more diffuse, dissonant, and sometimes harsh. He uses the time-honored technique of electric guitar feedback as well as the more modern devices of loops, digital echo, and filtering. Despite the electronics, Tollefson's pieces here are described in the liner notes as "guitar performances" which implies some element of "real time" playing. Tollefson does occasionally surface as a conventional guitar player, with some slowly played passages of low, resonant notes. Interestingly, as in track 8, "Sea Star," the piece begins with this type of somber, contemplative guitar, and then moves away from it into the almost toneless drones that characterize the other pieces on the album. The quiet guitar disappears into sounds that resemble airplanes taking off, or roaring winds, all of them run through digital echo. The only rhythms that Tollefson uses in these pieces are the pulses that arise from his sound-manipulation, mechanical waves which surge and play against each other in a noisy, icy, and sometimes grating way. It is definitely not "music for relaxation." If you don't like drones, this album won't appeal to you. Yet after all this racket, "Sea Star" concludes with the return of the quiet solo guitar. This track is the best example of what Tollefson is attempting with this esoteric album - the contrast between hand-played guitar and programmed electronics, music and noise. By the way, keep listening after track 8 finishes. There is, about a minute of emptiness later, a short and rather interesting extra bit of guitar improvisation as well as a peculiar bit of "found sound" (which sounds like someone chewing the slightly explosive candy "Pop Rocks")." "Recorded in 1998 and 1999, this CD features 58 minutes of guitar treatments which, although some recognizable guitar strains are present, generally manifest as abstract auralscapes of empyreal definition. This time, Tollefson turns his sonic expressions upon more earthly concepts, exploring tangible elements with his moody ambience. The guitars still bear little resemblance to traditional strings, being transformed into textural structures of sound that reverberate but flow with transcendental verisimilitude. The patterns surge with languid power, straining against a barrier that is more metaphysical than corporeal. Transforming a "Field of Blackbirds" into a liquid sound absent of any environmental quality, Tollefson applies a mutation of delineation to the concept, producing a condition that is too theoretical for clear imagery. Each of these pieces are immersed in similar sonic rumination, detaching the listener from the physical world, plunging the music into hypothetical states which stimulate the mind with their absence of physicality. Tollefson uses each pulsation and trembling texture as verbs rather than nouns, forcing the audience to exert their own creativity to complete the communication." "David Tollefson is an experimental guitarist whose recording debut began as a member (along with Hypnos founder and solo recording artist M. Griffin) of Viridian Sun on 1997's ambient/experimental work, Solar Noise. Tollefson's solo debut, New Eyes on the Universe, was released in the following year to wide critical acclaim. Viridian Sun's 1999 second release, Perihelion, went deeper into abstract sonic expressionism. His new release is a brooding, contemplative collection of eight compositions that drift deep into the listener's stream of consciousness. It contains cinematic atmospheres and dark abstract rich textures, both detailed and organic. It is a collection of some of the most beautiful haunting music I've ever encountered. It is one of the most thought provoking and significant musical statements that Hypnos has released to date. Near and Far brims with possibilities for the future, pushing electronic synthesis and acoustic manipulation deep into forbidden lines of enquiry. Tollefson's triumph here does not lie merely in his technical prowness, but in the emotional aspect of his music. The tracks that make up Near and Far are compelling and moody, displaying Tollefson's talent for traversing the space, ambient, and experimental genres with ease and grace"
"The Hypnos label is largely responsible for my recent re-interest in ambient. These (guitar, though you’d never guess) soundscapes by sometime Jessica Bailiff collaborator David Tollefson are my most listened to of Hypnos' recent releases. And while the label has issued outstanding work by vidnaObmana and Saul Stokes lately, somehow Near and Far is the album I keep coming back to." "Immensity is the concept that this album can evoke best in the imagination of the listener. Eight compositions based on hard synthesizer textures, on which melodic brush-strokes are drawn with a wondrous cosmic mysticism. The electronic orchestrations contribute in a remarkable way to recreate the landscapes suggested by each piece. Thus, for instance,"Maja" possesses crystaline textures, airy, full of light. As a general trait of this work, the music is slow, static, even hypnotic." Field of Blackbirds flutters in on gritty soundwaves, but soon morphs into smoother strands of dronestrata, hovering and surging in resonance, beautiful without further adornment. The rippling chords of Displacement are stronger, warped by more pronounced fluctuations amid a steadily thrumming bed of churning energies. All dissipates toward the track's conclusion, shifting into other forms, like a forceful stream becoming mist. The casually strummed notes of Twin Earth (4:57) (okay, there's a bit of strumming) plow through a murky pool of reverb. Dark discordant rumbles are met by buzzing strings in the mysterious realm of Lore, which proves to be an entrancingly subterranean soundworld. Softer and lighter, though still gloriously shapeless, Maja resounds with mutedly ringing tones and is delicately scraped by textural screeches of feedback. An abstract instrumental geography lesson studies the Pattern of Islands; this piece seems to explore negative space around which molten sonic liquids pulse and flow. If you're keen to hear some new ambient experimental tricks coaxed from an old instrument, here's a great place to listen. Alluring and amorphous, the transmogrified guitar noise from Near and Far mark another winner for both Tollefson and for Hypnos. A resounding 9.0 rating for the strange waves which I admire only slightly less than those from their predecessor, New Eyes on the Universe. " "The guitar seems to be the instrument which refuses to lay down and be categorised. Time after time I keep hearing yet another record whereby the musician involved is doing something creative, new and more often than not dealing in the experimental end of the musical spectrum. Tollefson is no newcomer. He released the excellent New Eyes On The Universe some time back on the same label.This second release is as good as his debut, if not even more engaging. You have to like textures and you also have to be able to tolerate drones in order to appreciate Tollefson's universe. There seems to be plenty of processing and layering happening here, with more than the occasional foray into resonance. It's not always easy going either. If you're expecting a nice easy laid back ambient adventure, forget it. It's dark and menacing, with a more than occasional dipping of toes into the oasis of ambient serenity. It kind of reminds me of what he was doing on the first release, but this time the palette of sound is richer and far more mature. The aggression, or sense of menace, I feel coming out of this recording, whether intended or accidental, is reminiscent of the works of another pioneer of sorts, Steve Tibbetts. Though I must say the similarity ends here. At time, when Tollefson is just playing around doing chord and key changes, when it's at its simplest and most unprocessed, an innocence comes out that is humbling to be a part of. I haven't heard much as of late which makes me sit up and actively listen. At a time when more and more mediocre recordings are flooding the market, it's good to hear someone doing something of genuine interest. I also think a lot of other labels would not have touched this one, maybe because it's not commercial enough. Hypnos are doing good things and I assume for the right reasons. ie interesting releases, great production, quality product and let's not forget making a profit of sorts to keep going. I would like to think that the future is indeed a shining star for Mike Griffin and co. Another thoughtful release. I can't speak highly enough about the label nor the majority of its releases." The second solo release by Viridian Sun's ambient guitar specialist, David Tollefson (following 1998's excellent New Eyes On The Universe) showcases his willingness to explore, never comfortable in simply re-hashing formulaic ambience, as he veers into more experimentally adventurous territory. The opening track, "Field Of Blackbirds," showcases both the calm and subtly experimental as layers of soothing, flowing ambience unfolds, but near the end, crisp embers crackle underneath, inspiring slight unease, nudging the norm. A looped, dull siren wail is threaded through "Displacement," leading one into a thick, roiling miasma of machinery grind sounds (but never noise, it's never noise in David's hands). Radioactive strings lash out from above during "Lore," while below, an unseen, rumbling entity seeks escape from within a maze of tunnels. The night tide brings a message of oncoming danger during "Dead Feather," a message that becomes more static and unclear as the track progresses, the message left undelivered, the danger, still looming. The finger-picked simplicity of "Sea Star" is devoured by a black hole of swirling noise (but it's never really noise in David's hands -- more a collection of tones forced to share the same sonic space) before the finger-picked guitar climbs out of the clamor. Another inventive ambient foray from the fluid guitartistry of David Tollefson." "Near and Far contains rhythmic and melodic passages combined with otherworldly guitar soundscapes which create relaxing and sometimes haunting atmospheres. It is certainly an excellent follow up to New Eyes on the Universe." "The second CD by this guitarist, following New Eyes On The Universe. In eight sketches he displays the beauty of the guitar - a somewhat mysterious machine that keeps attracting people to create ambient music. David is not just merely building drones, but he keeps a well-balanced line between laid-back drones, but also more 'heavy' textures (such as 'Displacement' which it's e-bow sound) or strumming snares (as 'Twin Earth', which sounds like a piano). The guitar and the many ways to generate sound is at times recognizable and at other times it's drenched away in spacey sound effects. It remains a warm, pastoral early morning walk, when there is mist in the hills and woods. Very nice work (again!)." "Abstract guitar soundworlds: space meets drones and noise. Not for everyone, and not for every mood, but well done." "I really thought Tollefson's New Eyes on the Universe was sensational, so the question was, would his next release measure up? On first listen to Near and Far, I think it's fair to say the answer is a resounding yes. This time, Tollefson allows himself to stretch the boundaries a bit further. Yes, the great guitar sounds are still there, ranging from minimal dark ambient to fuzzed out experimental noise. Starting in excellent form with the 11 ½ minute "Field of Blackbirds," we are treated to long, softly swirling guitar drones. The sounds slowly change and grow, wrapping the listener in ambience that straddles the territory between darker realms and relaxing calm. This piece has distinct musical subtexts, each running for a few minutes, seamlessly blended together. As this softly fades away, "Displacement" comes right at you with its much bolder, louder guitars. The tone is still ambient, but forceful, almost angry. The distortion repeats itself in a looping pattern, surprisingly trance-like considering the raw sound. "Twin Earth" is more reflective, a relatively simple but effective repeating guitar phrase, surrounded by deep echoing pulses of sound. "Lore" returns to richer, more complex textures, again with a rawer sound, though not as much as "Displacement." The sounds blend together quite effectively here. As usual, Tollefson coaxes an amazing variety of sounds out of his guitar, such that it is hard to believe that this is the source of all the music. "Maja," for example, has a strange, sort of spastic rhythm tripping quietly in the background at irregular intervals. My favorite track is "Dead Feather," a dark, dramatic piece. Things close out with "Sea Star," which is listed at 9:05, but includes a brief, somewhat unusual bonus track at the end for another couple of minutes. "Sea Star" features a great transition from some fairly ordinary guitar work into an almost Pink Floydish whirlpool of spooky textures, reminding me of their famous track "Echoes," though it goes off in some different directions as it builds to its conclusion, coming full circle to end with a surprisingly pretty guitar at the finish. Another great Tollefson exploration into the world of experimental guitar." 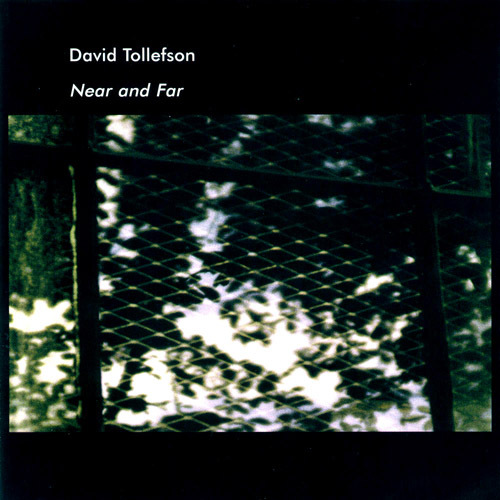 "Falling mid-point between the delicate guitar work (Near) of Steve Tibbets and the darker tones (Far) set by Null, the new David Tollefson, Near and Far is a recording replete with carefully balanced nuance; the Crystalline acoustic versus tactfully grinding electric Each track -- while connected -- contains its own diverse personality. Many artists become heavy handed with the effects pedals, yet Tollefson applies just the right touch with sounds so appealing and original that makes this one of the freshest guitar-based release in quite a while. While comparisons are inevitable this is not music one easily pigeonholes. Sonically the balance is spot on, natural with presence and gobs of ambient dispersal. Placed in the appropriate 'sweet spot' or using headphones, the entire soundstage is filled. No left channel-right channel techniques here. Yet another job well done by the Hypnos Team whom, it would seem, can do no wrong. Sound - 8.5 (rating out of 10 points)."